In previous posts, I have commented that the equity market and other markets are overvalued because of the effect of large scale quantitative easing by the US Fed and other central banks. In this post, I will summarize several warnings from highly credible analysts about equity valuations that have been published in recent weeks. When I think about US equity market valuation, I don't give much credence to the conventional Forward Price/Earnings (P/E) measure based on the current market price of the S&P500 divided by the 12-month forward projection of S&P500 earnings. Instead, I prefer to look at more credible historical metrics like the Cyclically Adjusted P/E (CAPE), originated by Nobel Prize winning economist Robert Shiller in his book Irrational Exuberance. CAPE compares the current price of the S&P500 with the 10-year average of S&P earnings with both variables adjusted for inflation. These measures tend to be mean reverting. The chart below, taken from Shiller's website (which can be seen here) shows the current valuation of the S&P500. 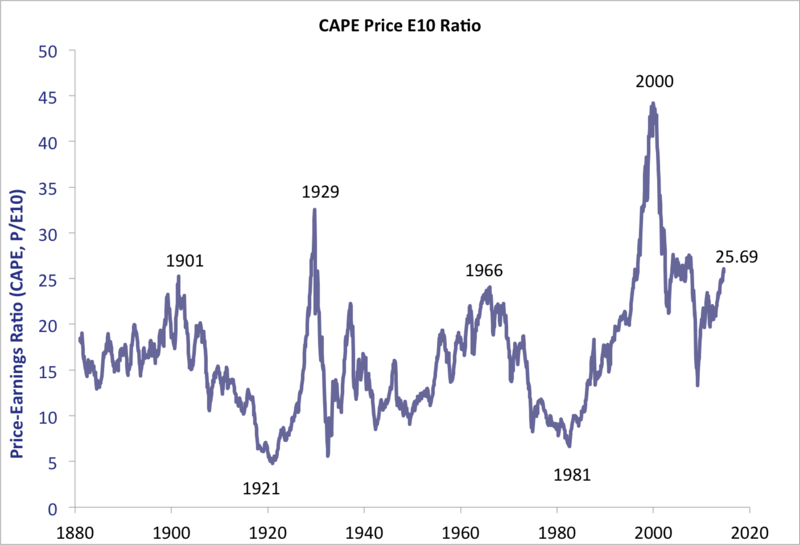 The current CAPE ratio, at 25.69 on August 15, suggests that only in the periods preceding the 1929 Crash and the 2000 Tech Bubble burst has the S&P500 been more richly valued. 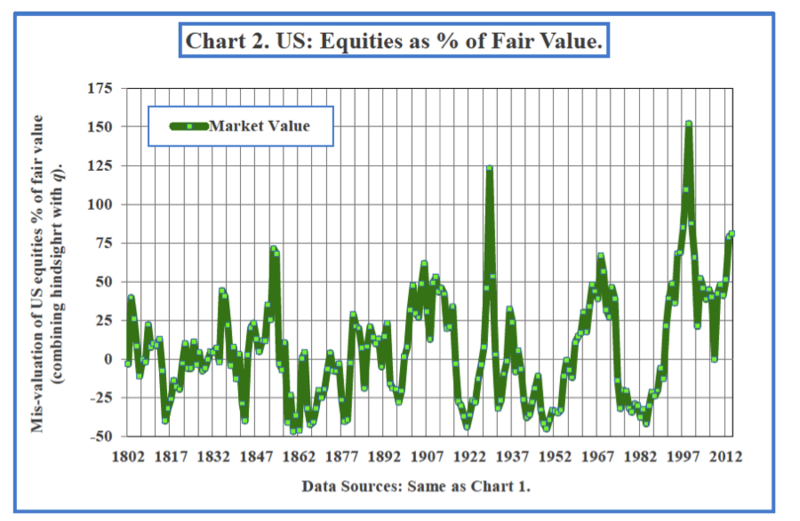 In those two periods and when the CAPE valuation reached close to current levels in 1901 and 1966, equity returns over the next 10 to 20 years were dismal. Another advocate of credible long term valuation metrics is Andrew Smithers, author of Valuing Wall Street. 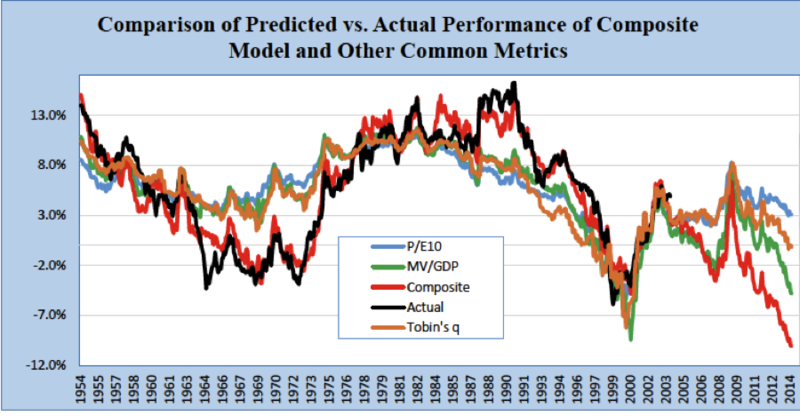 Smithers favored metric is Tobin's q, (named after Nobel Prize winning economist James Tobin), which is calculated by dividing a company’s market capitalization by the replacement cost of its assets. Smithers has recently ended publication of his periodic market outlook reports, but not before publishing a final report on July 15 (see here). In his last regular look at market valuation, Smithers combines his historical estimate of q with his own technique of hindsight value to come up with the chart below. As at 31st March, when the S&P 500 was at 1872, the market was 80% overvalued and only on five previous occasions (1853 71%, 1906 62%, 1929 123%, 1968 66%, and 1999 152%) has the market been more than 50% overvalued. Market swings have been long. The gap between these 50% plus overvalued peaks has averaged 49 years but, with so few observations, there is no evidence to suggest that there is any regularity in the timing of peaks or troughs. As I was doing the research for this post, I came across a new report written by Stephen Jones of String Advisors in New York, entitled, Forecasting Equity Returns: An Analysis of Macro vs. Micro Earnings and an Introduction of a Composite Valuation Model. The paper (here) examines the ability of CAPE and other metrics to forecast 10-year equity returns. One interesting finding is that a measure of equity market valuation favored by Warren Buffett, the ratio Market Value of corporate equity to GDP (MV/GDP), is a better predictor of 10-year forward returns than is CAPE. 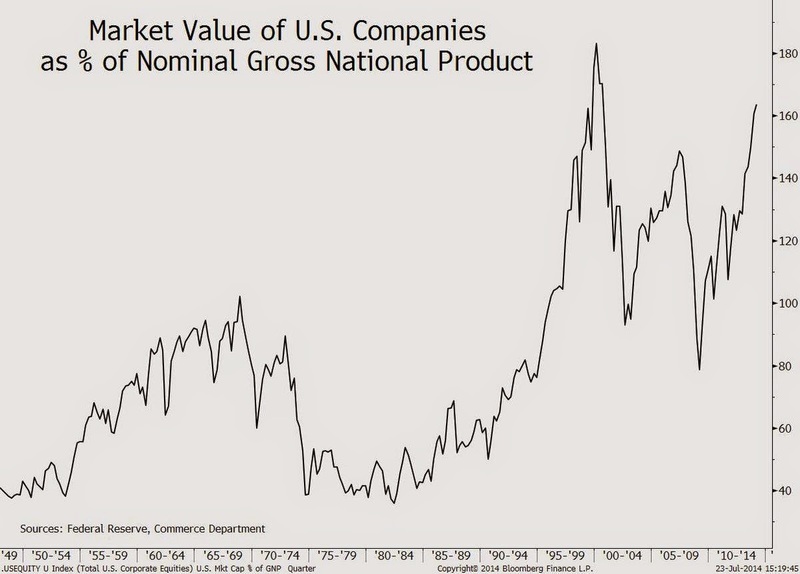 Bloomberg (here) published a chart of Buffet's favorite valuation metric, shown below. The following chart shows comparisons on several metrics reviewed by Jones. 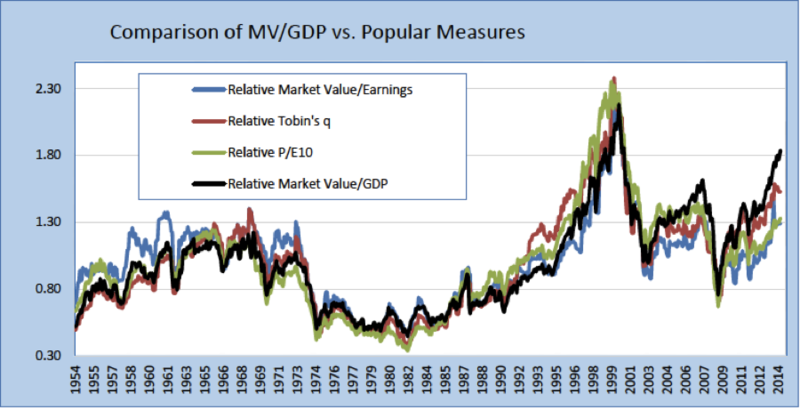 By all of these metrics, stocks look expensive, but they look most expensive by the MV/GDP measure. Jones goes on to argue that the market value-GDP ratio works even better at forecasting equity market returns in a multi-variable forecasting model which utilizes a demographic variable, a personal income to book value of US corporations variable, a personal consumption variable and a real GDP growth variable. This multi-variable or composite model, which Jones refers to as demographically adjusted and market adjusted (DAMA), has been a better predictor of 10-year stock market returns than any of the single ratio metrics discussed above. A comparison of the forecasts with actual results (the black line, which is only available through 1Q04) is shown below. While some Wall Street commentators have criticized Shiller's CAPE (here), it is interesting that Tobin's q (Smithers favorite metric), Buffet's MV/GDP, and Jones' composite model (which has the best 10-year forward forecasting record) are all forecasting much weaker returns than Shiller's CAPE. The point is that, starting from the current overvalued level of the S&P 500, all of the forecasts point to dismal returns for equities over the next decade. This does not mean that equities are about to crash or that stocks can't post decent gains over the next year or two. By most metrics, the S&P has not yet reached its valuation extremes of 1929 or 2000. Central banks continue to reassure that policy will remain accommodative. But the metrics do indicate that investor caution and alertness are warranted.